TDM Bhd is principally involved in plantation business. It currently has 37,000ha of plantation land with about 32,709ha or 95% of matured plantation. The remaining land was replanted. It also has two palm oil mills with annual processing capacity of 600K MT of FFB (Its FFB production in 2009 was 530K MT, nearing 90% utilization rate). What's attractive about this share is its cheap valuations and attractive dividend. 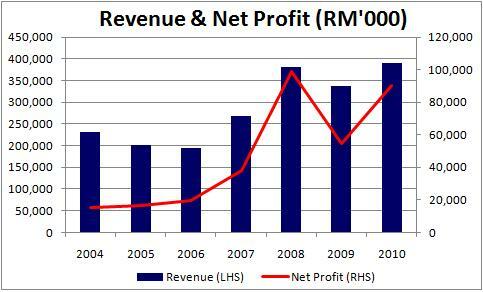 P/E could just be at 5x with estimated EPS of 40 sen or net profit of about RM90mil in 2010, assuming CPO price hovers at RM2,300/MT. If average CPO price stays above the current RM2,500/MT for the whole year, P/E ratio for 2010 earnings could even be lower than 5x. On the other hand, P/BV is at a mere 0.7x. It was also well supported by a healthy balance sheet with net cash of RM107 mil. On dividends, its dividend payout has been increasing from a mere 3 sen for FY2006 to 12 sen (Net div) for FY2009 which is equivalent to 6.2% at current share price of RM1.95 (Ex-date: 21 May 2010). Barring 2009 which was an exceptional year for plantation, margins were improving over the years which was in line with restructuring of its businesses over the past 5 years by divesting its non-core businesses such as Pelangi Airways, A&W and Perhentian Island Resort coupled with improvement in management of its plantation business. The recent 4Q09 net margin was high at 22%. However, the downside is that TDM is tightly held by the Terengganu State Govt which has about 70% equity stake. Nonetheless, the management has expressed its intention to improve the liquidity of its shares and also to work out a dividend policy which could be an added boost to its attractiveness among investors. TDM could also benefit from the introduction of NEM which might prompt the government to divest more stakes in GLCs which could improve the liquidity of GLC counters. Going forward, growth potential will come from its expansion into Indonesia in which the company has rights to develop 40,000ha of land into oil palm plantation. But the venture could only bear fruit probably in the next few years and not in the near future. Overall, a good stock to have just based on its cheap valuation and dividend payout. Attaching a PER of 8x is enough to send the share price to above RM3.00.